At the nexus of Broadway and Pacific Highway – BRIC is San Diego’s newest lifestyle destination, where visitors and locals can enjoy the sights, sounds and signature tastes of Southern California. Located on the waterfront in San Diego’s North Embarcadero, with easy access to local hotspots, attractions and recreation, BRIC is refreshing, always changing and always interesting. This is a come-together kind of wonderland where you can come to visit or stay awhile. Taste, Shop & Stay Awhile. With nearly 60,000 square feet of cafés, restaurants, boutiques and other shops available right on San Diego Bay, BRIC has something for everyone. Envision the beautiful Pacific Ocean as the backdrop of your next event with the buzz of downtown as the soundtrack. Lane Field Park is San Diego’s premier outdoor event venue, ready for your grandest plans. 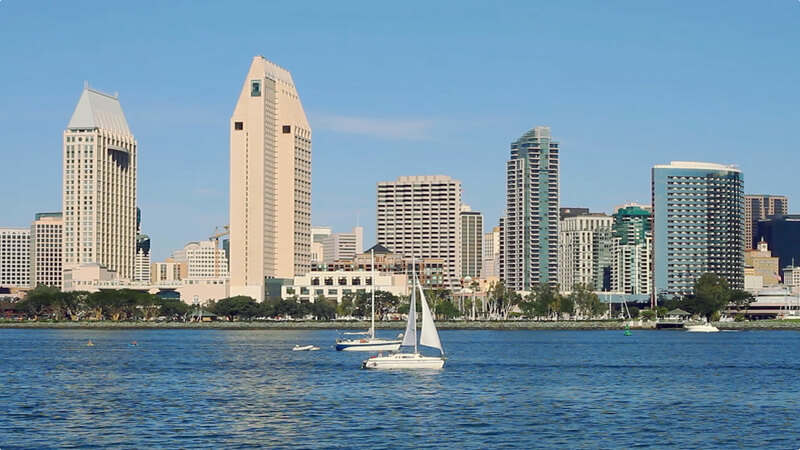 Take a walk on the Embarcadero along the San Diego Bay, and see what the city has to offer. The waterfront is home to an exciting variety of activities for all to enjoy – from BRIC to Waterfront Park to the convention center. From engaging conversation to fun moments, great tastes and surprises, you never know what you’re going to get at BRIC – but it’s sure to be something you want to experience. John Portman & Associates is famous for designing unmatched experiences for guests and locals alike. The project extends the public realm vertically, allowing for great views of the San Diego Bay and the events that occur along the waterfront. As a nod to the history of the site as the former location of Lane Field ballpark, these retail and terrace spaces step back from the park in such a way as to recall the bleachers of old. Enjoy BRIC like a local at one of our three hotels. With an ideal location within walking distance to the San Diego Convention Center and landmark attractions, you’re just minutes of Little Italy, the Gaslamp Quarter and the San Diego cruise terminals. Lane Field and BRIC are committed to protecting any personal information that you may provide to us. This site is provided by BRIC on an “as is” basis. BRIC makes no representations or warranties of any kind, express or implied, as to the operation of the site or the information, content, materials or products included on this site. To the full extent permissible by applicable law, BRIC disclaims all warranties, express or implied, including but not limited to implied warranties of merchantability and fitness for a particular purpose. BRIC will not be liable for any damages of any kind arising from the use of this site, including but not limited to direct, indirect, incidental, punitive and consequential damages. Prices, terms and availability are subject to change without notice. Models do not reflect racial preference. Photos and renderings are representational only and do not reflect actual property. Copyright © 2019. Your privacy is very important to us. As part of the normal operation of this website, we may collect information about you. Personally identifiable information about you may be used to improve our marketing and promotional efforts, to statistically analyze usage of the site, to improve our website content and to customize our website’s content and layout. We believe these uses allow us to improve our website and better tailor it to meet our users’ needs. We may use your first and last names, email address, your mailing address and telephone number to contact you from time to time. Lane Field will not disclose the general information you provide to any other company unless you request we share your information with certain builder companies that can provide you with more detailed information. Lane Field may aggregate personally identifiable information for other marketing and promotional purposes. We may share the personal information you provide with companies that we have hired to provide services for us. These companies – our vendors – are contractually bound to use the personal information we share with them only to perform the services we have hired them to provide. We do not share, sell or lease personal information about you to any third parties for their marketing use. We will release information about you if you direct us to do so, if we are required by law to do so or in other legally limited circumstances. You may remove your email address from the distribution lists of Lane Field at any time by notifying us.